The 2009 version of Apple’s Time Capsule combines the mundane tasks of networking, file sharing, and backups into one device, and it includes some cool new features to boot. Time Capsule, basically an Airport Extreme base station with a 500GB or 1TB internal hard drive, is designed to be a wireless Time Machine target for one or more Macs as well as a NAS (network attached storage) device. Time Capsule’s marquee feature is its ability to back up your Macs running Leopard using Time Machine over the network. Apple recommends that you connect your Mac directly to the Time Capsule for the first backup, which makes a copy of all files on your Mac; backing up that much data takes a long time over the network. I backed up my MacBook Pro’s 120GB of data to each Time Capsule connected via Gigabit ethernet and it took a little over nine hours to complete the first backup. After that initial backup, Time Machine will back up to the Time Capsule every hour (unless the Mac has been powered down or the previous backup took longer than an hour). These hourly backups are incremental—that is, they back up only files that have changed, or have been added since the last backup. Such backups take less time and are generally handily accomplished over a wireless connection. One thing to remember is that Time Machine backs up at the file level. So, if you use a program that frequently makes changes to a large central file (like Entourage, which stores email in one large database file), Time Machine will back up that entire file, even if only one item in the file has changed. This can impact wireless backup performance, depending on how large those files are. You can also use one or more external USB drives attached to the Time Capsule’s USB port as a Time Machine target. The backup functionality hasn’t changed with this new version of Time Capsule, so the same basic problems still exist: you can’t swap out the internal drive, and even with the 1TB model, you may run out of disk space if you’re backing up multiple Macs as well as using the internal drive for file sharing. (Theoretically, you should not run out of space, because Time Machine culls older backups; but users have reported that they have run out of room on the disk. Apple says that before OS X 10.5.5, Time Machine sometimes reported the Time Capsule drive as full when it was not. Also, Apple says that a rare problem with Time Machine backup image corruption on Time Capsule was corrected with base station 7.4.1 firmware and Mac OS X 10.5.6.) Speaking of file sharing, when we last reviewed the Time Capsule ( ), file transfer speeds weren’t exactly zippy. I transferred a 1GB video file to both Time Capsules, as well as to a Mac via AFP. Transferring the same file to either Time Capsule took about 33 percent longer than it did to transfer to the Mac. This is fine for occasional file sharing, but if you’re doing a lot of file sharing, you might want to check into a dedicated NAS or Mac file server. All of that functionality is old hat. These updated models do introduce a few new features: simultaneous dual-band, a guest network, and the ability to access your Time Capsule’s disks via AFP over the Internet (specifically, file sharing over the Internet, not using Time Machine to back up or recover files over the Internet). Simultaneous dual-band solves this problem by splitting traffic into two separate networks with one base station: older clients stay on the slower 2.4GHz band; 802.11n-enabled Macs and other hardware use the 5GHz band. This preserves the speed of the 5GHz band while allowing older devices access to your network. By default, Time Capsule broadcasts both networks with the same SSIDs (the technical term for a network name), though you can set a different name for the 5GHz network. 802.11n-equipped Macs with the latest AirPort client software (available only for Leopard) automatically switch between networks, depending on which is optimal for the conditions of the wireless client. If your MacBook ( ) is placed far away from the Time Capsule unit, it will use the 2.4GHz band, which is slower but has far greater range; when your Mac is closer to the base station, it switches to the 5GHz network without any user intervention, assuming that both networks share the same name. 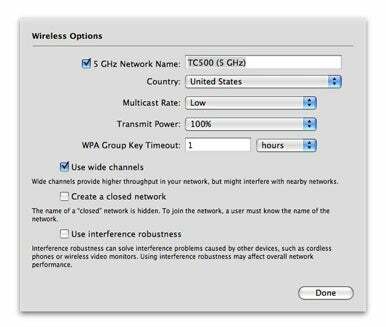 If you change the name of the 5GHz network, this feature doesn’t work. To make sure that the Time Capsule could stand up to some serious network traffic, I gathered four Macs (two on the 2.4GHz network, and two on the 5GHz network) and pumped lots of traffic between the two pairs. It is important to determine whether Time Capsule can provide consistent and high rates of data transfer over both networks at the same time. If the device isn’t able to handle lots of traffic over both networks, then it is of limited use. The other big feature in the new Time Capsule is the guest network. Who hasn’t played host to a laptop-toting friend who needed to get on the wireless network to check email or surf the Web? It’s likely that you have some sort of security, so that your friend would need a password to get on the network. Furthermore, let us assume that, while you’re concerned about security, you’re also lazy or forgetful and tend to pick one good password and use it for everything, including your wireless network. That means the password you’ll give your friend is the same one you use for your bank account, your own email, your credit card logins, and so on. How well do you really know that friend of yours, anyway? You have a few options for your Guest Network. This Guest Network has no password because I’m a nice guy. Guest network to the rescue. The guest network uses the same 2.4GHz and 5GHz radios as your main network, but this network is virtual. It connects to the Internet just like your main network, but it uses a different name and can have a completely different, though limited, group of settings applied to it. Users on the guest network have access to the Internet, but all local network traffic, including Bonjour, is hidden. This means that network resources available on your main network, such as printers and file servers, can’t be seen. A optional setting (modified via a checkbox) lets you allow guests to network with each other, but that still protects your main network. If you’re generous, you can also choose to omit a network password, leaving the guest network open, or you can give it a different password than the one you use for everything else via standard WPA/WPA2 personal encryption. (Older WEP encryption isn’t available.) 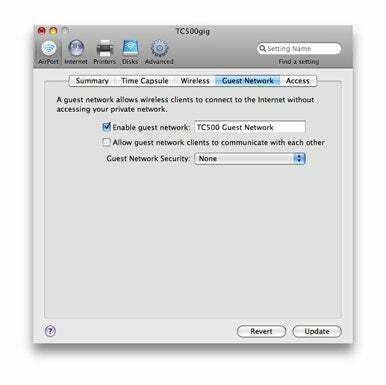 The Time Capsule’s guest network is also simultaneous dual-band (although the two guest network bands must share the same name), so all your guest’s devices will connect at the highest speeds they are capable of. That makes all network devices, and their owners, happy. The final—and coolest—new feature takes advantage of Leopard’s Back To My Mac functionality by allowing you access to your Time Capsule’s drives, either internal or attached via USB, over the Internet. You must have an active MobileMe ( ) individual or family pack account. You enter your MobileMe credentials in a new tab in the AirPort client, and, like magic, you’re able to access your Time Capsule over the Internet from another Mac that has that same MobileMe account registered in its MobileMe preference pane with Back To My Mac active. I was able to access my Time Capsule drives from an AT&T hot spot blocks from my house without a hitch, though I could not access it from my corporate network at the office (which is not too surprising, given the increased network security of corporate firewalls). Transfer speeds using Back to My Mac to connect to your Time Capsule will depend greatly on the network connection at your current location, and the connection back at home. It was pretty speedy in my testing, but speed will vary widely from location to location. Transfer speed isn’t the point with this feature, though; access is. It doesn’t take much to imagine a number of scenarios in which being able to access some files stored on your Time Capsule at home will come in handy. The 5GHz network can have a custom name, if you choose. Not only can you access your Time Capsule’s disks using Back to my Mac, you can also manage the Time Capsule remotely using the AirPort Utility. I can see this being very useful if you’re trying to troubleshoot networking issues while on the road (assuming the connection isn’t completely down). Apple’s latest Time Capsules are what any good networking and backup devices should be: easy to set up, manage, and forget about. If you’re replacing an older base station and want to use Time Machine to back up multiple Macs, the new Time Capsule is well worth it (getting the 500GB version and buying a large USB drive to act as your Time Machine target will save you a couple bucks). If you only have one Mac in your household, it is far cheaper to use a directly attached disk for your Time Machine backups, but even in that situation I can see a use for Time Capsule. I’m a fairly forgetful laptop user. Chances are I won’t remember to plug that external backup disk into my Mac on a regular basis. (Time Machine will alert you if you haven’t backed up in 10 days, but I’m not comfortable with that big a gap in my backups.) The beauty of Time Capsule is that it just works, silently backing up your Mac over your network without your having to remember a thing. Things get a little more complicated if you already have one of the previous Time Capsule models. All older 802.11n base stations—Time Capsule, AirPort Extreme, and AirPort Express ( ) —get the MobileMe update, with remote hard disk access on all but the AirPort Express. That leaves the two hardware features as deciding factors. If you have many Wi-Fi-using guests, are running two different Wi-Fi networks to get the most out of your wireless network, or are planning to upgrade from a 2.4GHz-only network, then the new Time Capsule is a great way to simplify your network and gain added functionality. If your home network is pretty basic and you already own a first-generation Time Capsule, there isn’t much to warrant buying a new one.